A long time ago a poor Mexican girl was going to church with her brother. Every child and adult went to church on Christmas Eve. Everyone brought a present to place on the altar to honor the Christ Child who had been born so many years before. Everyone except for little Pepita. She had no gift to bring to the Christmas Eve Services. Pepita walked slowly to the church her brother, Pedro. Her heart was filled with sadness rather than joy. "I am sure, Pepita, that even the most humble gift will be acceptable in the eyes of God if it is given with love." said Pepita's friend Pedro. Not knowing what else to do, Pepita knelt by the roadside and gathered a handful of common weeds and made them into a small bouquet. She was embarrassed by her humble gift. But, at least she tried to bring something to the service to honor the Christ Child. She fought back a tear as she entered the village church. As she carried her gift to the alter, she remembered Pedro's words. "Even the most humble gift will be acceptable in the eyes of God if it is given with love." 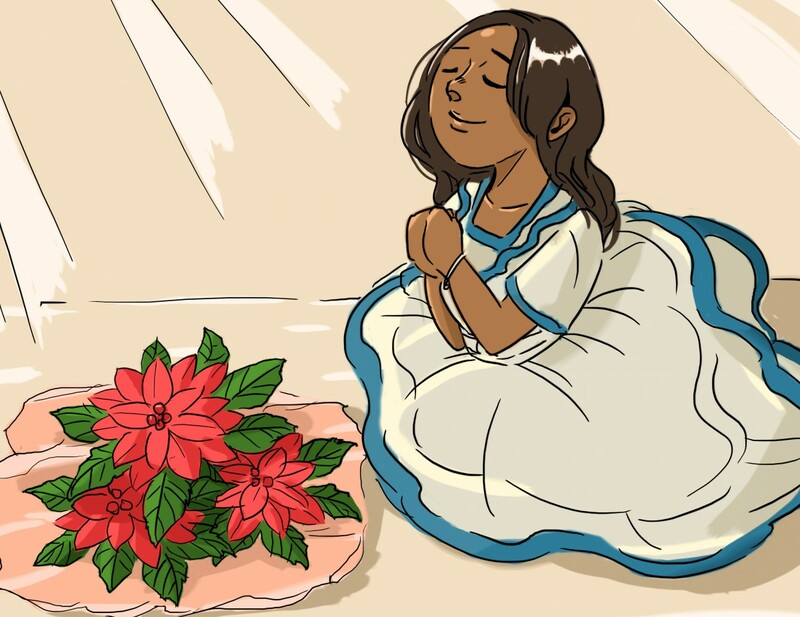 She felt better as she knelt to lay the bouquet at the foot of the nativity scene. Suddenly the weeds burst into blooms of beautiful red. Everyone who saw them were certain they had witnessed a Christmas miracle before their eyes. From that day on the bright red flowers were called Flores de Noche Buena, or Flowers of the Holy Night. They bloom each year during the Christmas season. Today the name for this plant is the poinsettia.